The 2013 OLA annual general meeting, held in Tyrone Ontario was the scene of a major announcement. 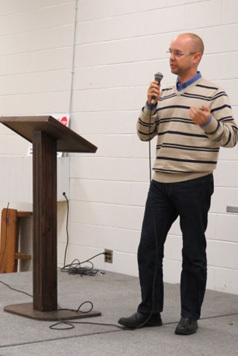 Kurtis Andrews, a lawyer with Green and Associates Law Offices in Ottawa and guest speaker at the meeting, told the crowd of about 100 that on Friday October 18th an application to question the constitutionality of the Ontario Society for the Prevention of Cruelty to Animals (OSPCA) Act was made to the Ontario Superior Court of Justice. The court is being asked to consider four questions. More information is available at http://www.fixthelaw.ca. This challenge, funded by the OLA Litigation Fund, is only possible because of the past and continued generous donations from those who believe like us that bad legislation can and should be changed. Other speakers included Elizabeth Marshall, OLA Researcher, Tom Black, President of the OLA, and MPP Jack MacLaren speaking on various property rights issues. The Directors returned Tom Black as President and Jeff Bogaerts as Vice-President. The meeting wrapped up at about 5:30 PM leaving time to socialize before a very well-received roast beef dinner was served a 6 PM.